What is your craft & how did you get started? Floral Designer for Events and Weddings. I went to Texas A&M for college and Majored in Floral Design. Everyday is different with Posh Floral, but an average wedding week starts on Monday with prepping the hardgoods for the wedding. Then on Tuesday, our flowers our delivered and we will process them and get them all ready to design the rest of the week for the wedding. Saturdays are usually wedding days so we get to the studio to load up the truck and drive to the view for a full day of setting up for the wedding. Do you recall a particular moment when you realized you absolutely had to start your own business? Yes. Well I had actually started it because I had friends tell me I was talented enough to start a business, but I was working a full time job while doing floral designing. The particular moment when I knew I should go full time with Posh Floral was so clear to me though. My faith in God is the biggest part of my life and I had been praying for God to give me a clear answer on what to do so one Sunday at church God clearly gave me a peace by reminding me of Matthew 14:22-32 of Peter walking on water. This story was a big step of faith for Peter and I knew going full time was the same thing. What’s the greatest challenge of being a small business owner? What is the biggest reward? The greatest challenge as a business owner is to be patience and not try to rush the success I am experiencing. My biggest reward is making people happy. Of all the jobs in the world, I get to see people be awed and amazed by the art of flowers. If you could save three hours a week by delegating a task, what would you delegate and what would you do with the extra time? Well it used to be bookkeeping or really not bookkeeping, I am so thankful that I don’t have to do that any more and I get to really look at things I am good at a good focus on that! With that extra time I would work out. 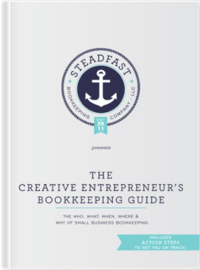 When did you decide you needed a bookkeeper (hooray – that’s us!)? How has your business benefited from this service? It was a couple years ago, someone told me I didn’t have to drown in receipts and numbers any more! It’s helped so much. I don’t have to stress about bookkeeping and I get to focus on making pretty things. What advice would you give your 21 year old self, regarding career goals? I would tell myself to plan for the future because it’s going to be amazing! What are three things you can’t do business without? My designers, my phone, and Macbook. Thank you so much, Angie, for taking the time to share your craft with us! You can follow Angie on Instagram for more pretty shots of her gorgeous work! Photos by Jenny & Eddie.